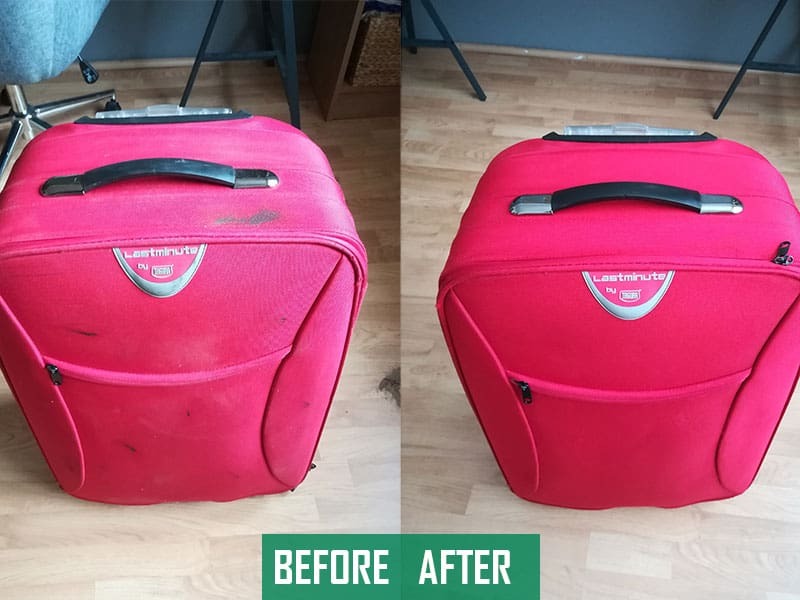 How To Clean Luggage: Make Your Suitcase Look Brand New! Last week we visited a music festival in Estonia. While sitting in a comfy red armchair in the apartment that we were staying in, I could not notice how filthy my luggage had become. Just look at the picture that I took. (Probably most of it came from our recent road trip across Europe that we did last month.) So I did what any reasonable person would do. I went on google and searched how to clean luggage. It turns out that it’s not that simple. There are many different techniques for each type of material as well as some tips for some specific accidents. I mean, there are fabric, hard shell, and leather suitcases and each requires a different technique to deal with. Anyway, I figured that this would be an excellent idea for an article. So I did a lot of research on how to freshen up a dirty and old suitcase. Here I’ll share my research and teach you how to clean your luggage correctly. 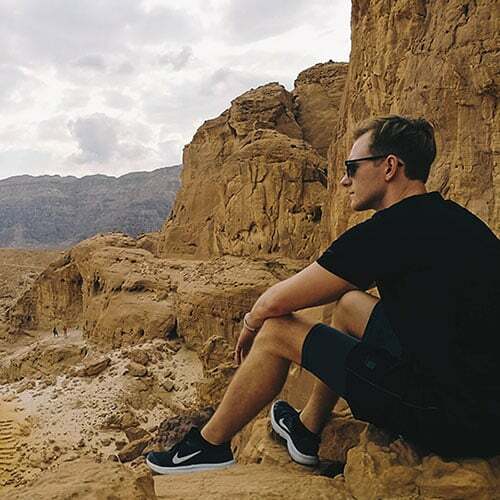 Also, if you still fail to restore your luggage to its previous condition, read this guide where I compare the 16 most popular luggage brands before buying your next case. Ready to start? Let’s start by cleaning the main compartment first! Start by taking out all removable items, like attachable pockets. You can wash those separately in a bowl full of water and laundry detergent. Open all of the zippers and give your luggage a good shake. Then vacuum your suitcase. This gets rid of all of the larger particles. If your luggage is fabric, you can go all in and wash the whole case in a bathtub. (Pour the bathtub full of water and laundry detergent and wash your case thoroughly using a brush on the stronger stains) However, if you don’t want to make a mess, continue to the next step. If you still have some dirty patches, mix some laundry detergent with water (1:5) and apply to the dirty areas using an old toothbrush. Finally, wipe down with a soft cloth and warm water. I’ve found that the best way on how to clean fabric luggage was with a foaming upholstery cleaner. Basically, you apply the cleaner, rub the foam in with a brush and finally vacuum the whole case. Get rid of the larger particles with a brush and a vacuum cleaner. Now prepare your cleaning product. Any fabric and textile cleaner that foams up when applied will fit this technique. Apply your foaming upholstery cleaner with a larger brush, paying the most attention to most visible dirt patches. After 5-15 minutes (depending on your cleaner) vacuum off all of the foam with a dry/wet vacuum cleaner. Repeat the process for the patches that didn’t come out. If you can’t get rid of it even after the second clean, it’s probably a grease patch, which has to be treated differently. I’ve included advice on how to clean grease off luggage, scroll down below to the appropriate section. Clean all of the plastic parts with soapy water and washcloth. If scratch marks are visible after cleaning, I’ve included tips on how to best hide them below. Leave your luggage in an open space, with all of the zippers open to let it dry. Editors Tip: Try to purchase darker colour luggage. Inside and outside. My other carry-on by made Travelpro is pretty resistant to stains, mainly because it’s black. First, prepare your cleaning product. Any kind of soapy water is fantastic for cleaning a hard shell suitcase. Mix some dish soap with water in a separate container, and you should be fine. Test cleaning a small part of your luggage with the soapy water and a washcloth. If everything appears to be coming off nice, continue with the whole case. After finished make sure to wipe down all of the soapy residues with clean water and a washcloth. Now your case should have some of the more prominent marks left. Try cleaning them with either some baking soda mixed with toothpaste or nail polish remover (which worked best for me). First, apply with a toothbrush on a smaller spot to test if it doesn’t damage your case. Lastly, if you want to get rid of all of the deeper scratches, scroll down below. Clean your wheels, handles and other plastic parts with soapy water and a washcloth. Dry your luggage thoroughly with all zippers open. For cleaning leather luggage, avoid vacuuming the exterior, as it leaves some scratches. Also, avoid cleaning with a lot of water, as it may damage the leather (A half-dry washcloth shouldn’t damage anything). Firstly, remove all of the dirt with a dry cloth. For all of the corners and smaller places, use a dry toothbrush. After most of the dust is gone, try removing the most visible marks with a special leather cleaner (Leather sofa cleaner works just great! ), applying it with a soft cloth. 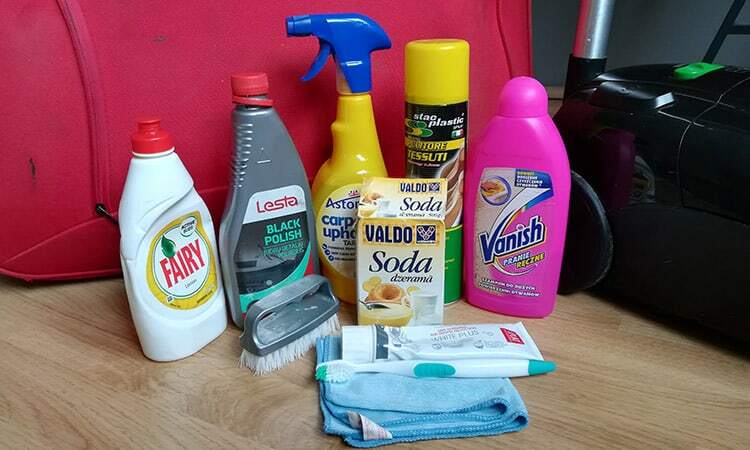 If your case is suede, use a special cleaner for suede leather, that’s usually applied with a brush. If your case is really beaten up, some of the larger scratches can be removed with a special leather marker. However, make sure that you purchase the right color. As always, if you’re cleaning any leather, don’t forget to apply a leather conditioner. So your suitcase is protected from further scuff marks and looks brand-new. It can be a real mess if one of your wine bottles breaks in your checked luggage. 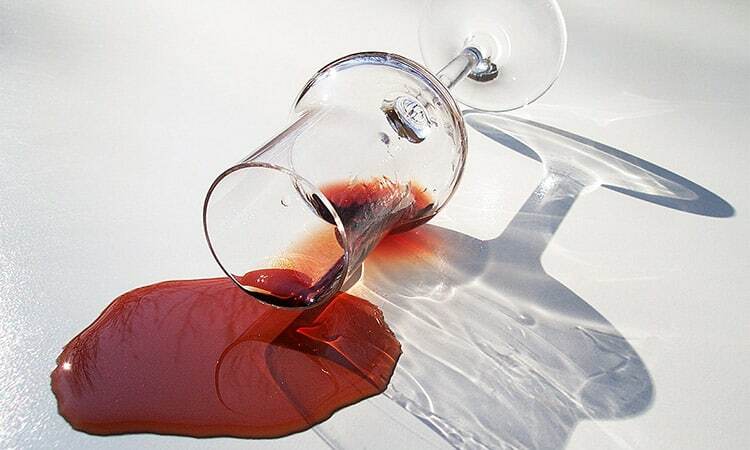 Not only do you have to clean up the red stains, but there’s glass everywhere! Same goes for shampoo bottles that accidentally open and other liquids. That’s not a problem though, because of these easy-to-follow steps on how to clean luggage from messy liquid spills. Let’s get started! Vacuum all of the broken glass shards. If it’s still fresh, clean up most of the liquids with newspapers or a wet vacuum. Mix up some laundry detergent with warm water (1:2). With an old toothbrush, apply to the dirty spot. Clean with some warm water and a washcloth. Just imagine how much your luggage has been tossed around when checked. Luggage handlers have to move tons of baggage each day, so pretty often your luggage can be damaged upon arriving. Although dents and broken zippers can’t be fixed, most of the scratches can! 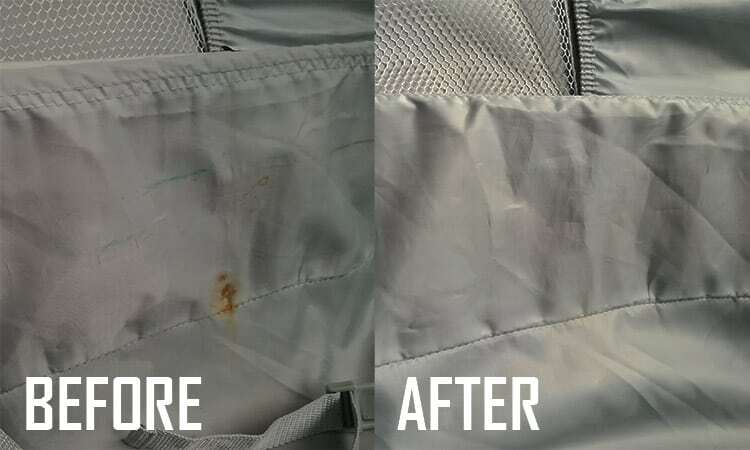 Of course, some deeper scratches require a more in-depth treatment, however with some of these tips, you can easily hide 80% of the scratches on your luggage. Furthermore, different materials require different treatments. You can get scratches on hard shell luggage, plastic parts, and leather cases. First of all, you should always clean your case with soapy water, before attempting to remove scratches. This will clean all of the dirt and goo out of the scratches that make them more visible. After that, you should find a simple pencil eraser (I borrowed this tip from getawaytips.azcentral.com). Believe it or not, this works quite magical. Just rub the eraser along the scratch a few times, which will result in the smaller scratches completely gone and deeper ones less visible. For the deeper scratches, try applying a regular toothpaste and rub it in with an old toothbrush, which will make most of the deeper scratches disappear. Lastly, you should apply a regular car wax or car polish to your hard shell. It will fill most of the scratches, give your case a bright shine and protect from future scratches. However, you should wax it only if it has a smooth and shiny finish. Also, avoid getting it on black plastic parts, as it will leave a white residue, which can be hard to get out. You should try it on a less visible spot at first and continue only if everything looks good. First of all, get your plastic luggage parts squeaky clean. Use soapy water and a washcloth to remove dirt from scratches. Use regular olive oil. Gently rub it on your plastics with a soft cloth. Although it’s a temporary solution (It will last a few months if you’re using your luggage often), this makes your plastic parts restore the vibrant deep colors that they once had. Also, all of the scratches become almost invisible. If your plastic parts are black, you can find a black plastic trim restorer in most auto stores. Generally, it’s a thick, black paste which needs to be rubbed on your plastic parts with a soft cloth. However, be careful not to get it on other parts of your case. This paste makes your black luggage parts pop and hides all of the smaller scratches. Lastly, you can try using a heat gun. Although, this is the most dangerous method of all three because you can easily damage your luggage. Just heat up your plastic parts from about 10-20 inches with a heat gun until your plastic parts restore their rich color. 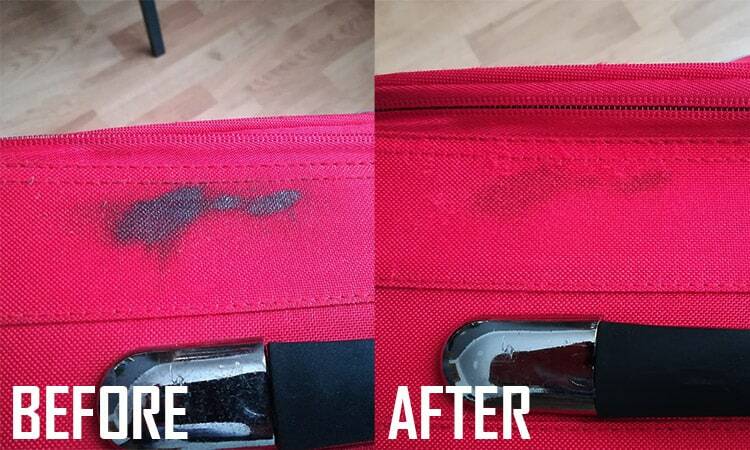 If your leather suitcase has scratches, they can easily be hidden with the right products. 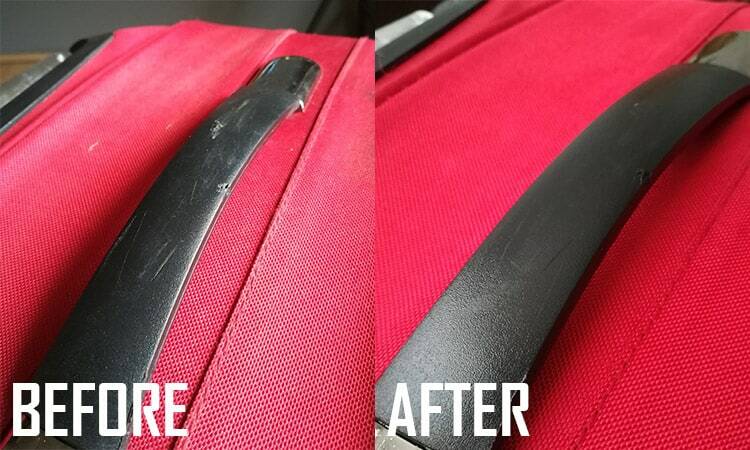 As with the previous section, removing scratches from leather luggage can be done in many ways. Start by cleaning your case with a dry cloth to remove most of the dirt, so you can assess in what condition your suitcase is. After determining how many scratches need to be removed, you have a few options on how to remove them. If your case is in a pretty good condition, you will be okay with just using a regular leather cleaning product. These come in different colors, which usually slightly restore the original color as well. A regular leather sofa cleaner works just fine! For some of the deeper scratches, try using regular olive oil. Pour a teaspoon of olive oil on a smooth cloth and gently rub it in your deeper scratches. Let it sit for five minutes and clean it off with a soft dry cloth. This should fill the leather with the olive oil and make it restore its original color. Try using regular shoe polish on the deeper scratches. Note, that you should be using the right color that matches your luggage. Although this is only a temporary solution, most of your scratches will be gone! If you can get your hands on a leather marker that’s in the right color, you can simply paint the scratch with the pen and it will be less visible. When I thought I was close to finishing cleaning my case, I came across these black spots on my suitcase. I thought that it was just some dirt, but upon closer inspection, I figured out that it was mechanical grease. It turns out that grease on your luggage is pretty standard for checked baggage. (With some people reporting that almost all of their case was covered with oil and grease!) And this can be the worst because if you’re cleaning it with the wrong products, you’re just rubbing it in even more. Actually, I did rub it in pretty aggressively before actually learning the proper way of cleaning it off. First of all, you should get most of the grease off by pouring some dry baking soda and cornstarch on the dirty spot, rub it in with a toothbrush and let it sit for a while. It soaks up most of it, so you’re left with as little grease as possible. I borrowed the following mixture from a user suggestion, which worked out really great. Fill a glass half full of warm water, add a half tablespoon of dish soap and a tablespoon of oxi clean (or similar alternatives). Mix it all up and apply to the greasy spot with an old toothbrush, rubbing in for one or two minutes. Finally, clean it all up with a soft cloth and warm water. Repeat these steps two or three times and the stain should be almost gone. Although I couldn’t remove it completely, I managed to remove about 90% of the stain. 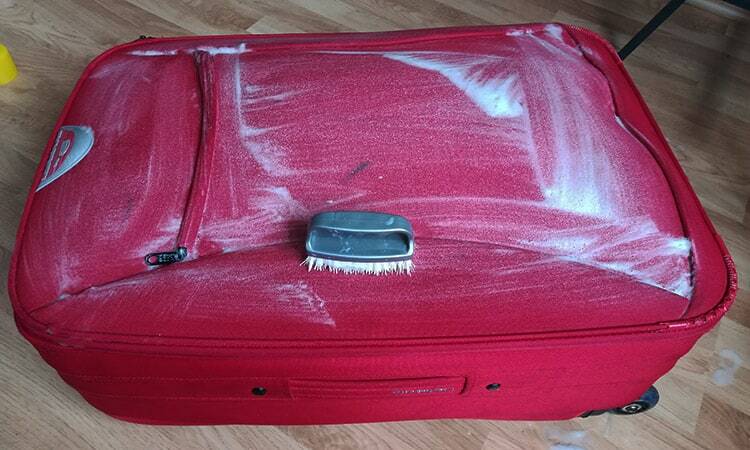 If your suitcase is bright-colored and covered with stains, most likely it will be impossible to get them out fully. Not only is mould pretty disgusting, but it’s also horrible for your health as well. However, don’t be alarmed if your suitcase has been sitting in the basement for a year and now is covered with mould. (Even if it’s really covered!) You can clean it all out with white vinegar (I borrowed this tip from a guide by hunker.com). Also, the white vinegar kills off any mould, so you don’t have to worry about health issues. First of all, if you’re dealing with mould, it’s better to clean it outside, as it’s bad to breathe in. Take your case out in an open space and clean it all up with a damp cloth. Make sure to wear a face mask for protection. The next step is to fill up a spraying bottle with white vinegar. Spray the vinegar all over your case and let it soak in for a few minutes. Clean it all up with a soft cloth and warm water. It’s advised to repeat this process for a second time to kill all of the microbes that are in your case. After that, continue cleaning the rest of your luggage as usual. Finally, leave your case to dry with all compartments open in a well-ventilated space. Also, vinegar has a particular and strong smell, which will be evident for a few weeks. However, don’t worry because after a few weeks your suitcase should stop smelling of vinegar. If you know any other useful techniques for cleaning luggage, please share them below in the comments! Now your luggage should be squeaky clean and look brand-new. However, if you’re looking for something fresher, I’ve made a list of 9 tech-friendly carry-ons.